This post is about George Elgood. Unless you have pored over old arthouse auction catalogues or spent time looking at watercolours on provincial gallery walls he’s someone you’ve probably never heard of. He might look a typically mildly eccentric Victorian gent but a century ago he was the leading garden painter in Britain. 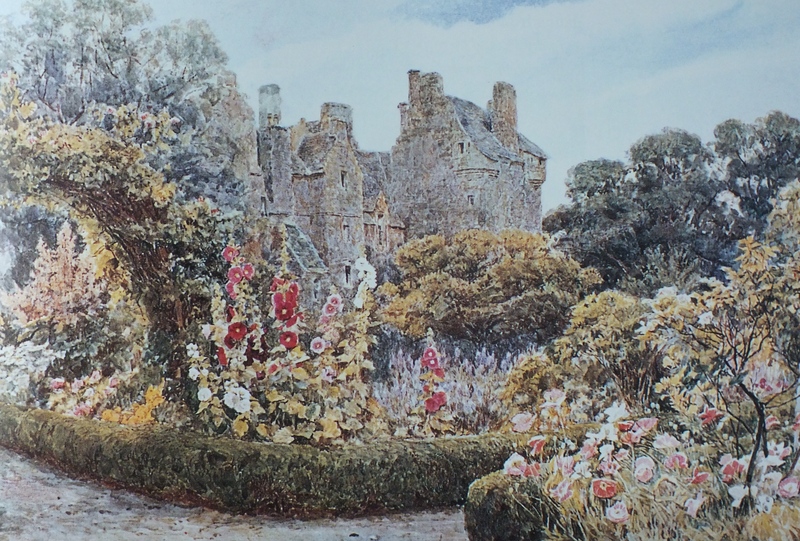 He illustrated books too including one written by his friend Gertrude Jekyll. 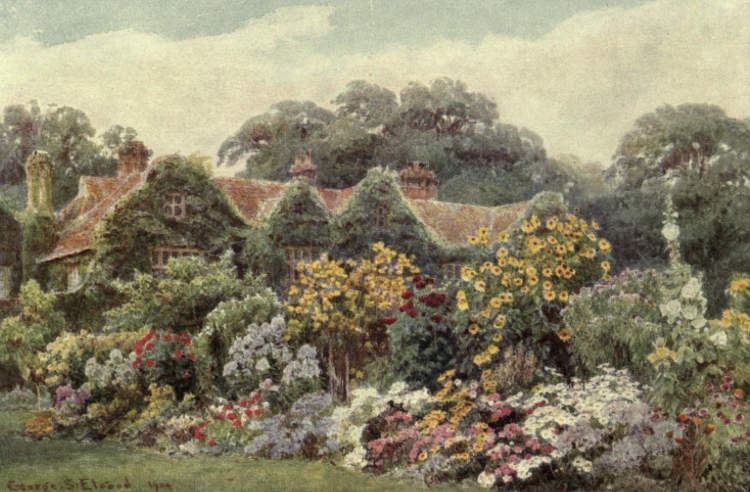 A keen gardener himself he also knew Edwin Lutyens, Dean Hole, William Robinson and Ellen Terry. 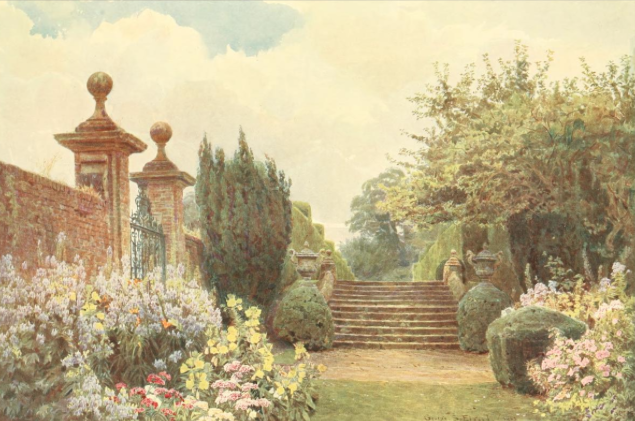 Elgood was a master at capturing in watercolour what is often described as the golden age of English gardening: the decades just before 1914. 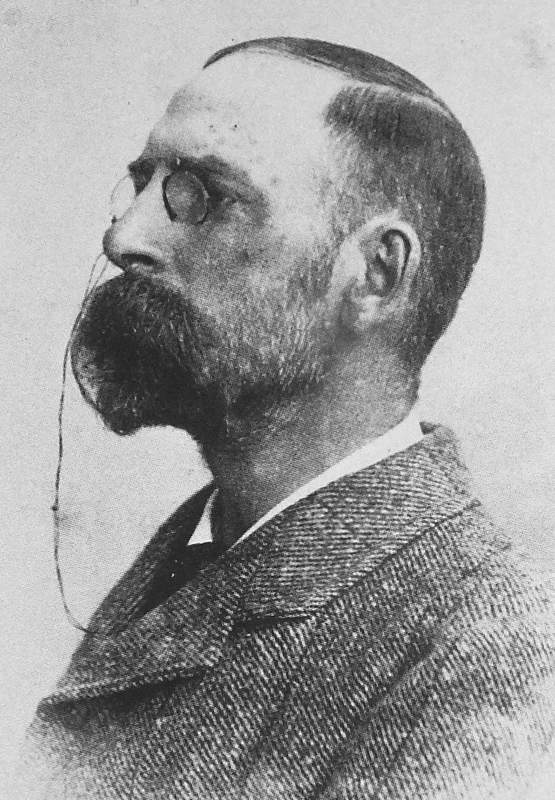 Born in Leicester in 1856 Elgood was one of 12 children. He went to the local art school and then to study architectural drawing at what was to become to the Royal College of Art. 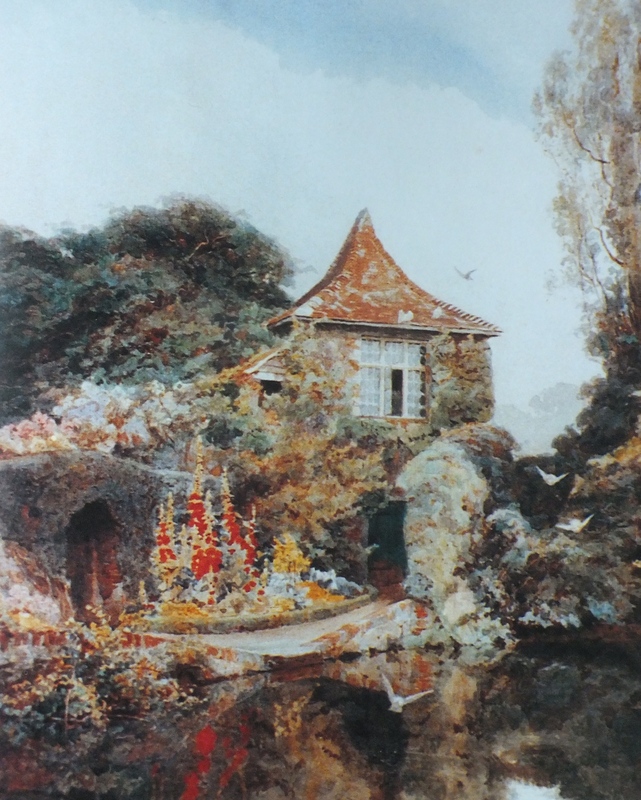 He had to curtail his course in 1874 when his father died, and he returned to take control of the family textile business, although he still painted in his spare time. 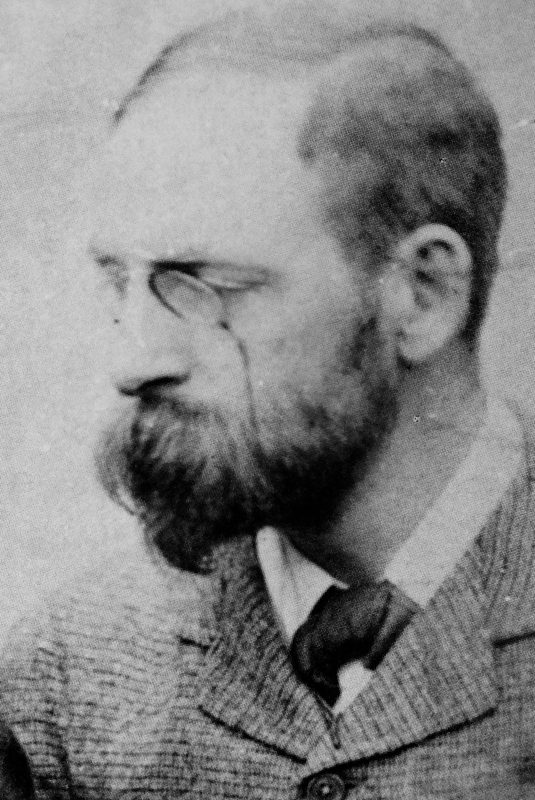 His first exhibition was at the Walker Gallery in Liverpool in 1877. It was obviously successful because there were further shows there in 1878, 1880 and 1881. 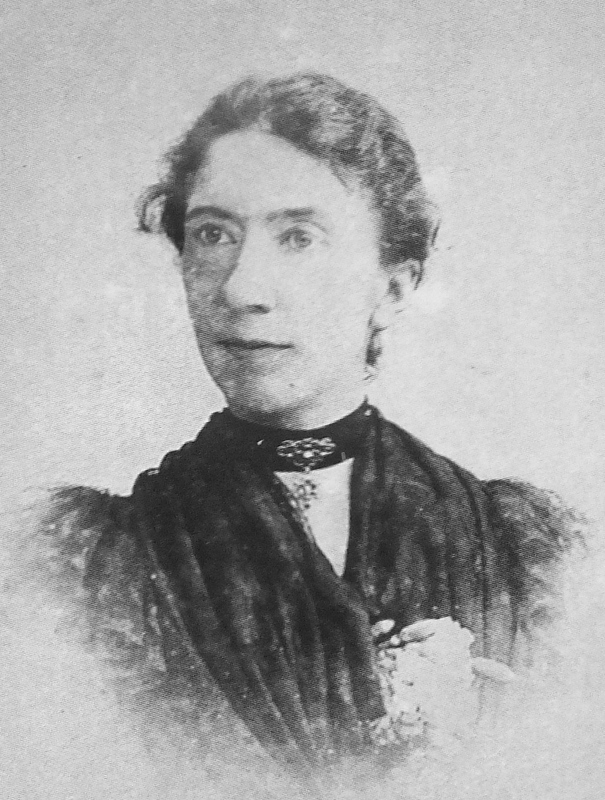 In 1881 he married Mary Clephan, who was also an artist – but with the added advantage of being an artist with inherited money. This meant George could abandon the business and together he and Mary began to travel round Europe and the Mediterranean, and paint. It was Italy that captured their imagination and they returned there for several months every year travelling and painting the gardens and landscapes. 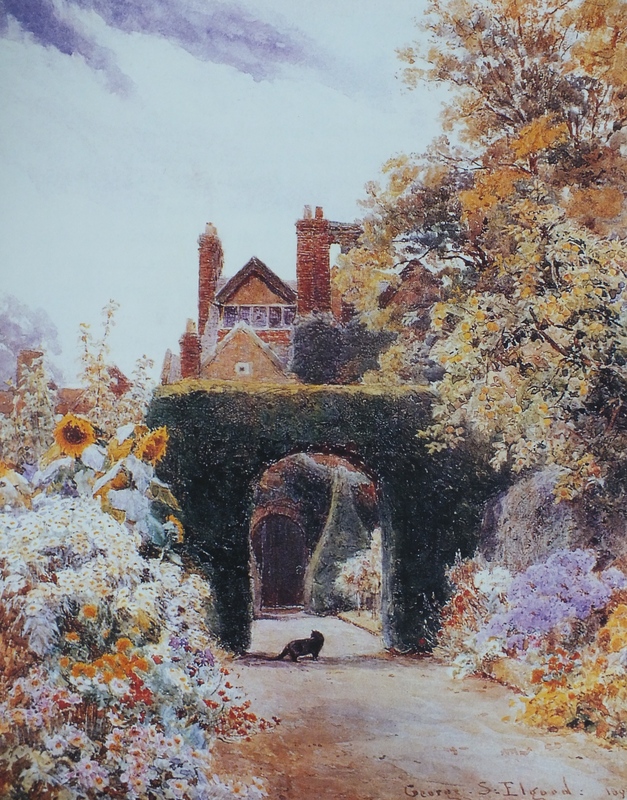 His first exhibition at the prestigious Fine Arts Society in 1891 was called Summer Among the Flowers and featured paintings of the gardens of many historic houses such as Penshurst, Montacute, Compton Wynyates and Arley. 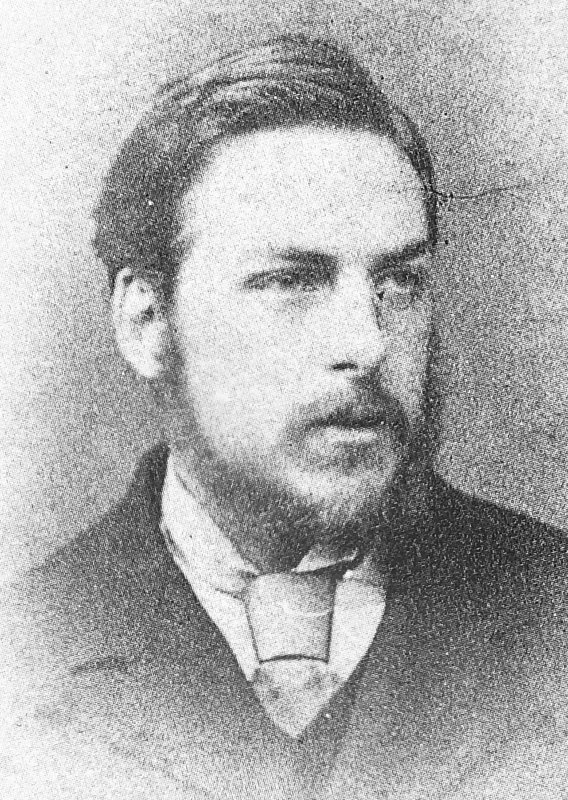 In 1893 he held his second, Gardens Grave and Gay, which included paintings of Losely, Levens and Melbourne amongst others. To increase the sense of nostalgia and add ‘authenticity’ to these pictures he often included figures in 18thc dress usually modelled by Mary. 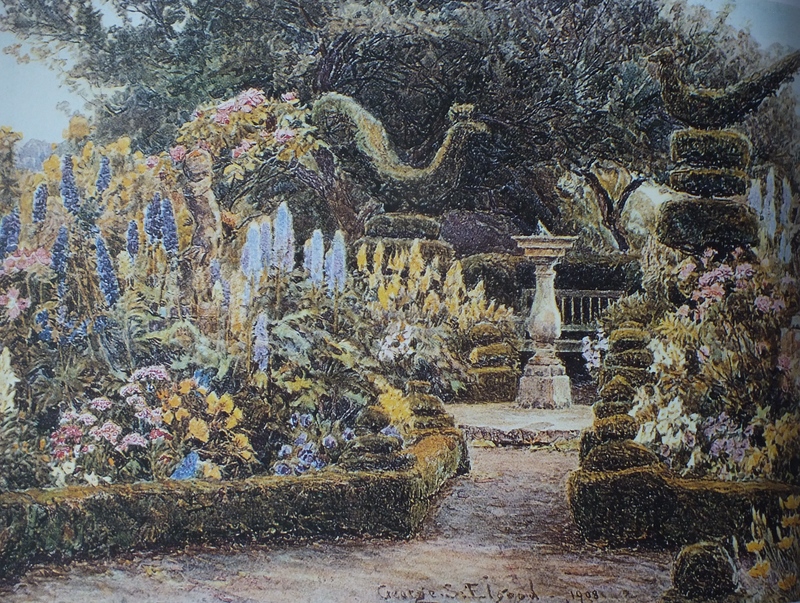 His third major exhibition, Gardens of Many Lands followed in 1895. He continued to show at the Fine Art Society every couple of years until 1921, usually with a mix of English and foreign garden paintings but he became even more popular once he started illustrating books. 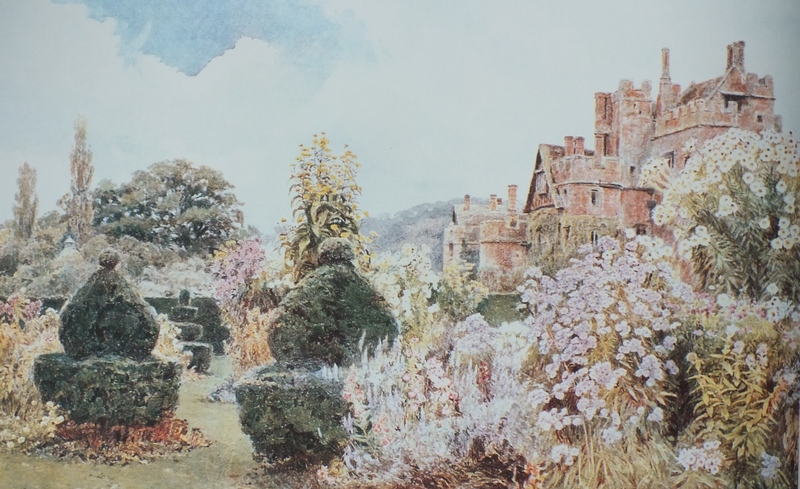 Some English Gardens has 50 of Elgood’s watercolours. 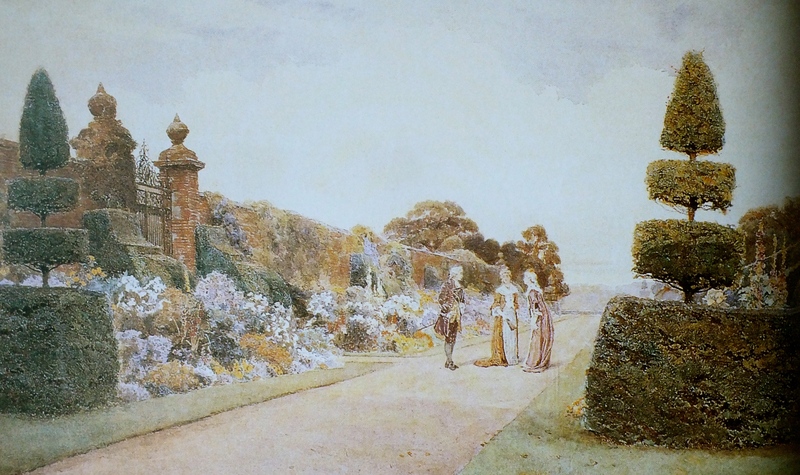 He also provided notes from which Jekyll constructed the descriptions of 32 renowned gardens, interspersed with some sections on particular plant families and planting combinations. They definitely seem to have been on the same horticultural wavelength. 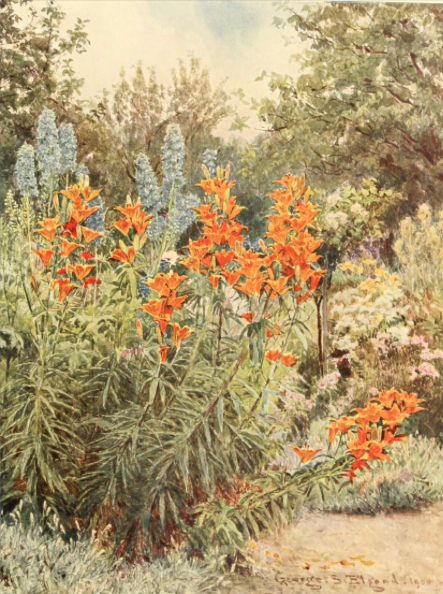 Many of his paintings, particularly studies of groups of flowers, show the same appreciation of form and colour, so in a way his paintings are a reflection of her belief that gardening is painting pictures with plants. 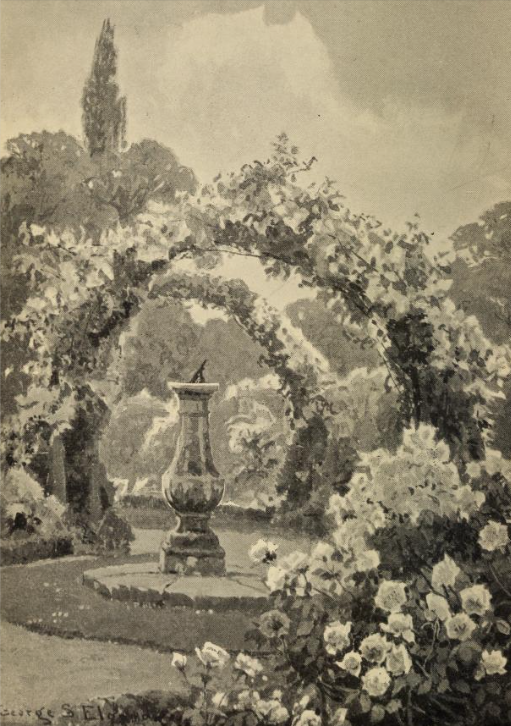 Next came his work for the poet laureate, Alfred Austin, whose The Garden that I Love, first appeared without illustrations in 1894. 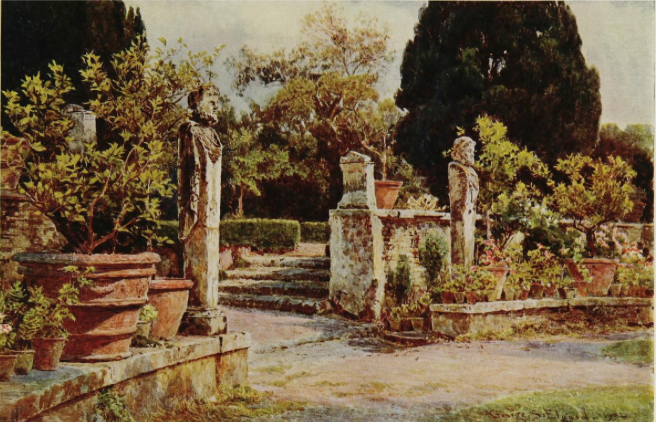 Elgood provided 16 for the 1906 edition, and he then illustrated Austin’s continuation, Lamia’s Winter Quarters of 1907, with some of his Italian paintings. 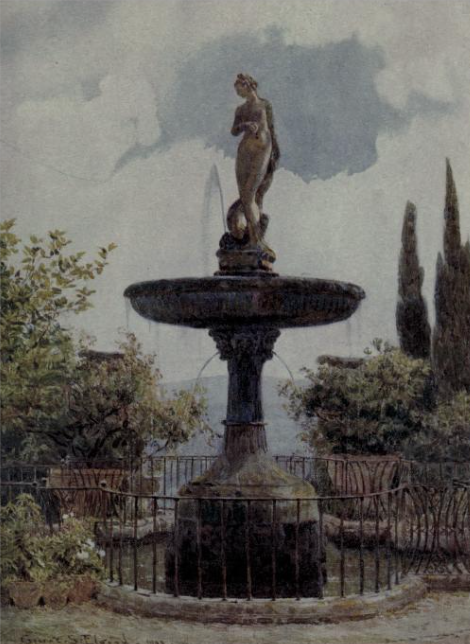 After the success of Some English Gardens he both wrote and illustrated Italian Gardens which enabled him to show his work on the both the great Italian Renaissance gardens, such as the Villa Borghese, Villa D’Este, Isola Bella, and lesser known ones as well. This was also published in 1907. Elgood was, particularly as he grew older, a surprisingly anti-social man. 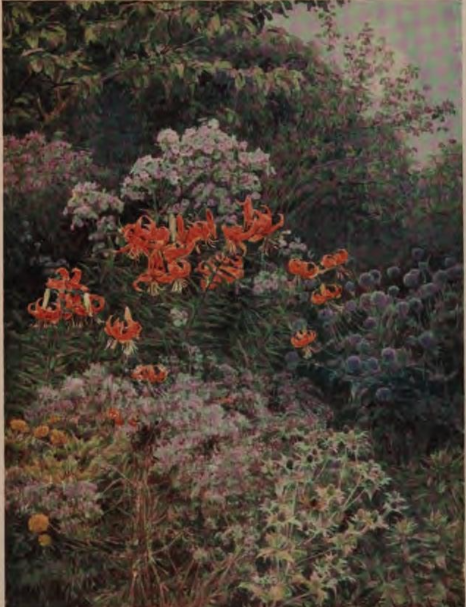 He often painted his own garden at Markfield in Leicestershire, but gave it a series of made up names when he used the images in print, presumably because he cared for his privacy and did not relish unwanted visitors coming looking for his garden. 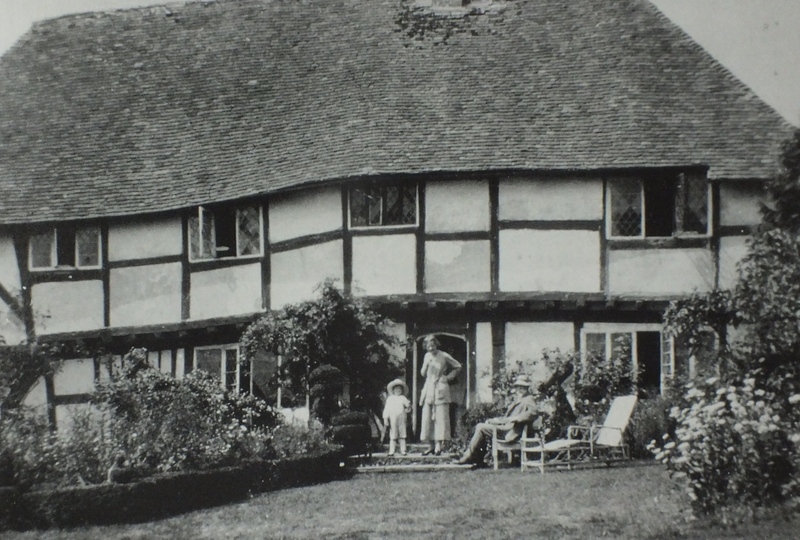 In 1908 he and Mary moved to Knockwood at Tenterden in Kent, but they did not sell their cottage at Markfield and returned there most summers to see family and friends. 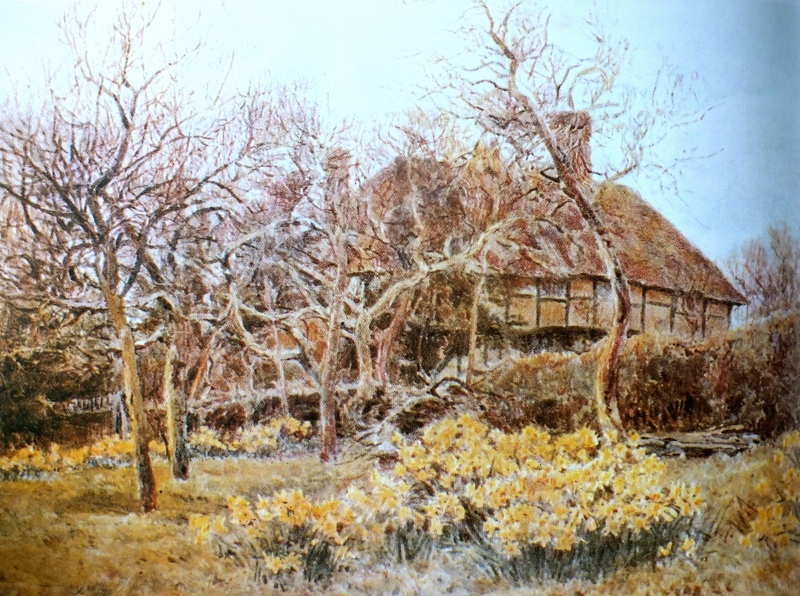 Knockwood was a timber-framed mediaeval house and both it and the garden needed restoration. The couple designed their own garden, complete with topiary, stone walls and paths, pergola, and cottage garden flowers. George painted it many times. 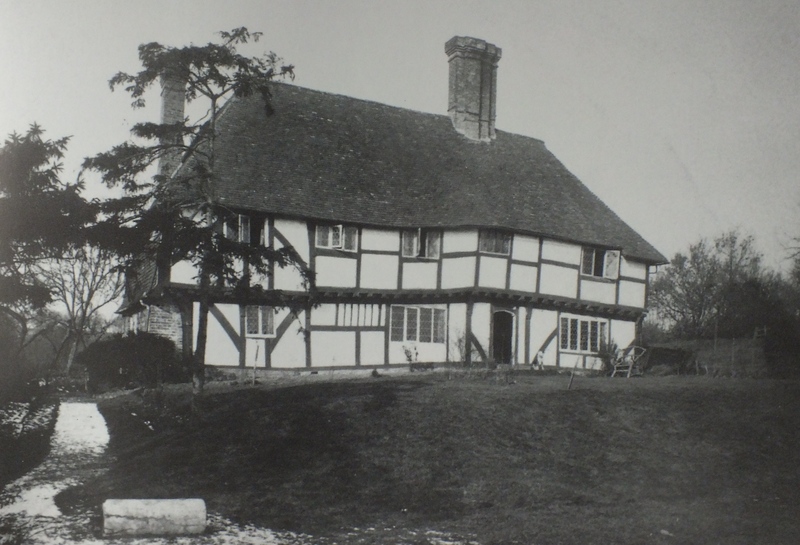 The Elgoods were childless and when Mary died in 1925 George’s niece moved from Leicester to look after him although she complained that he refused to have electricity or internal water supply. 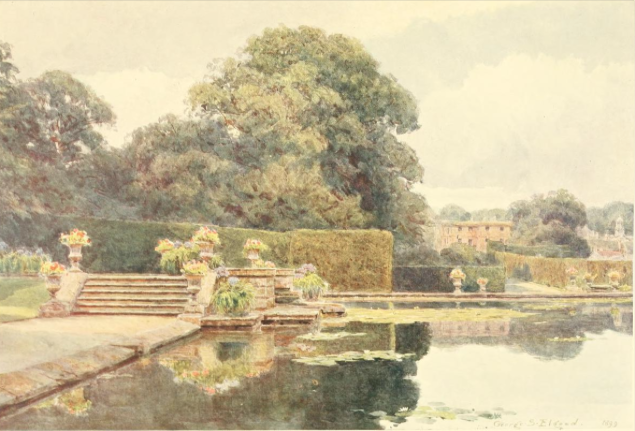 Later in life Elgood took up occasional work as a landscape gardener, specialising in the laying out of formal gardens, and becoming an authority on Renaissance gardens in England, Italy and Spain. 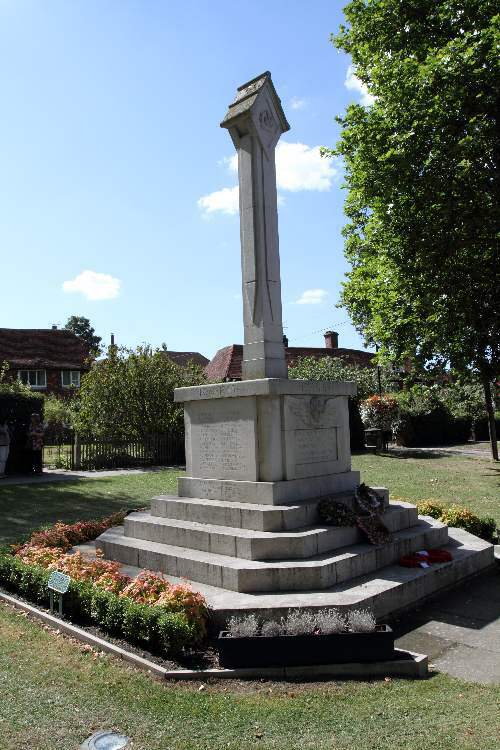 He also was involved in designing the War Memorials in Hastings, Smallhythe and Tenterden. The older George got the more cantankerous and eccentric he became. When the local authority council decided to cut down trees next to Knockwood he apparently got his gardener to build a hut and installed himself there with a shotgun threatening to shoot the first man who started cutting: they gave in and the trees were not touched. He finally died as recently as 1943 aged nearly 80. 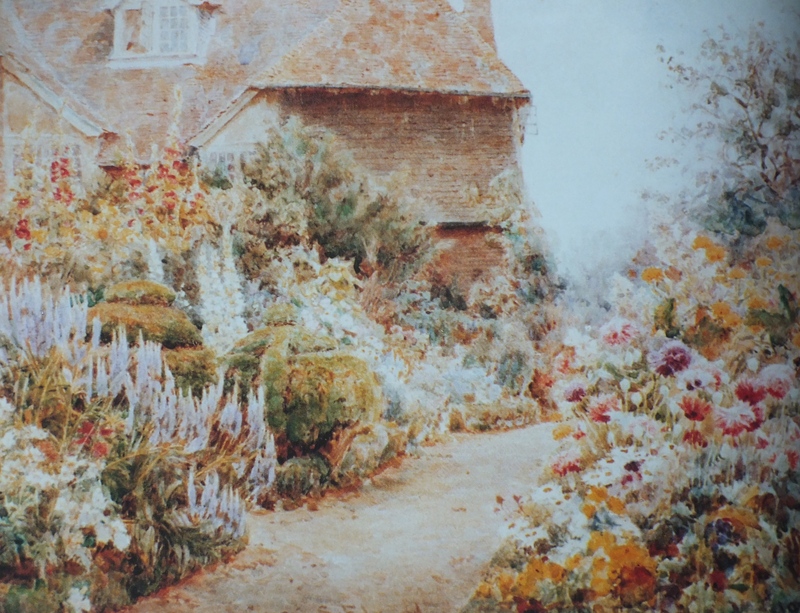 Unlike his contemporaries, Helen Allingham and Myles Birkett Foster , who he knew and liked, Elgood was not really interested in painting cottage gardens. And when he did he always tried to include something architectural such as a wall or topiary. 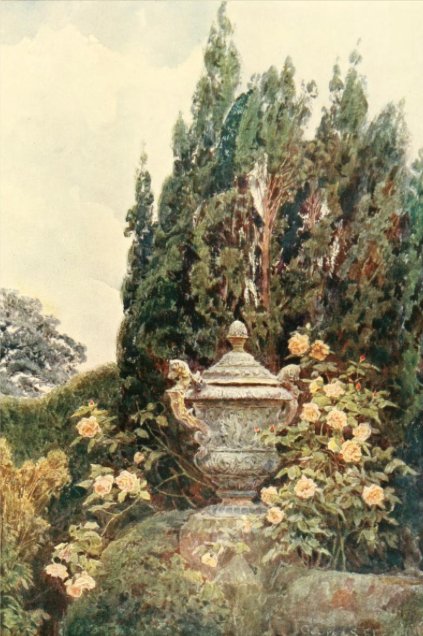 In all his work he proved especially successful at capturing perfectly kept herbaceous borders, immaculate hedging and topiary, and pergolas dripping with roses. 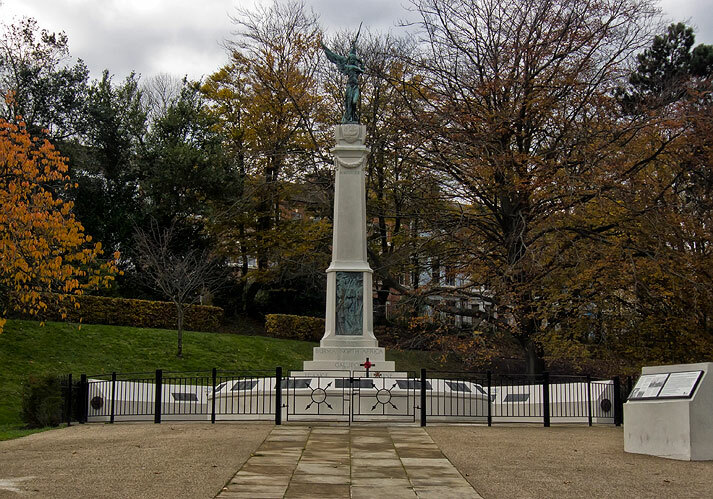 There are, however, few gaudy flowerbeds instead flowers are usually shown in a formal structure and setting. 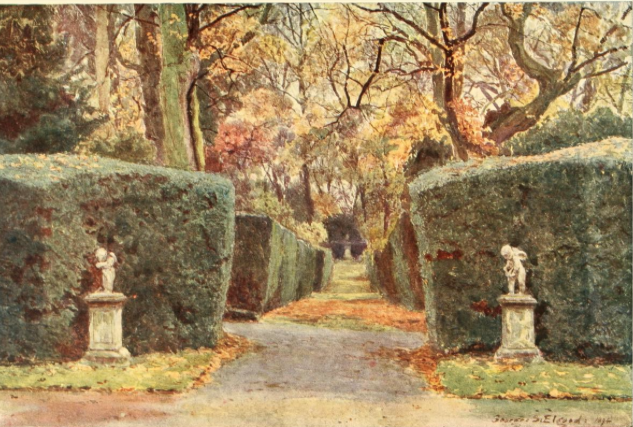 His colours are gently muted and soft, far less strident than many other garden painters such as Beatrice Parsons [see post about her on 8th Nov 2014]. 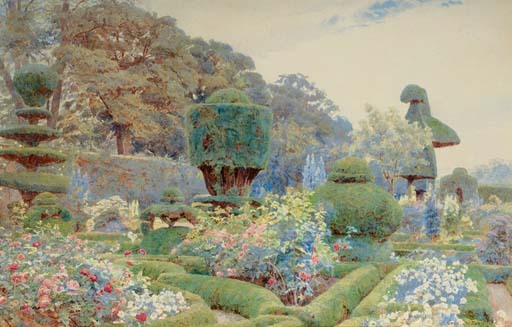 Elgood is not just a technical master in watercolour but manages to catch “the transitory spirit of a garden by … delineating its firm structure… the overlay of leaf and flower, elements … and the play of light, [which] make up its composition.” No one has ever surpassed him. To discover more about the man and his paintings the best place to start is a beautiful large-format monograph by his great-niece, Eve Eckstein, herself an art historian. 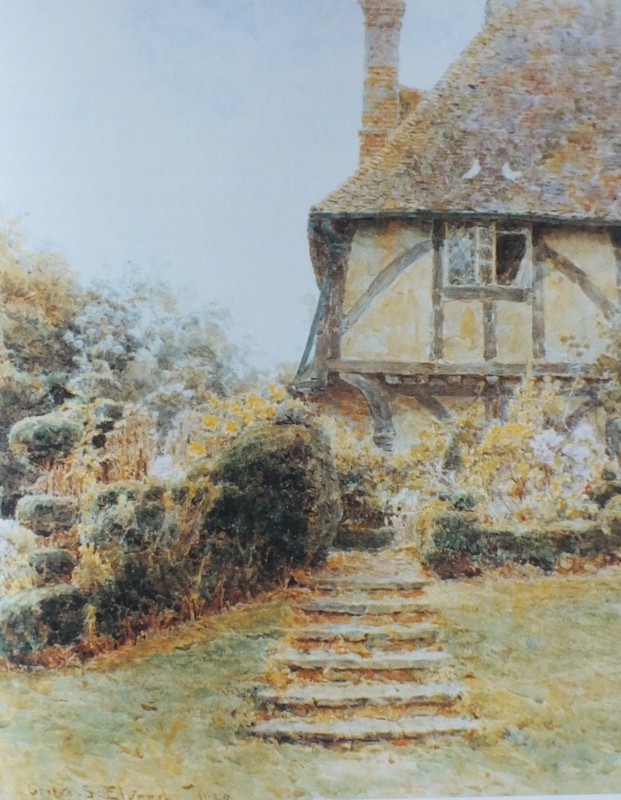 George Samuel Elgood was published in 1995 by Alpine Fine Arts, and is easily available second-hand. 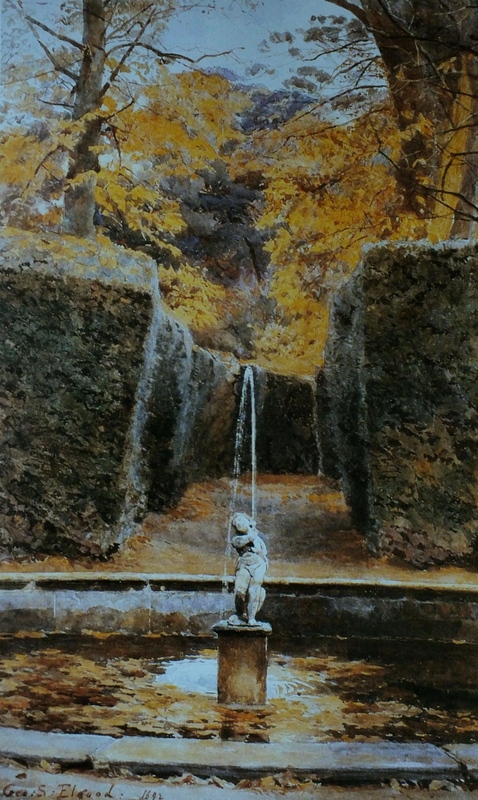 This entry was posted in Uncategorized and tagged Alfred Austin, arley, Beatrice Parson, Bramham Park, Compton Wynyates, Dean Hole, George Elgood, Kellie Castle, Levens Hall, Losely Park, Lutyens, Melbourne, penshurst, Thomas Mawson, Victorian painters. Bookmark the permalink.